Here are 20 wild, wacky, weird, telling, and often-meaningless stats from the Red Sox first 10 games. 2. Sandoval leads the team swinging at 97 pitches, next is Mookie Betts with 83 and Hanley Ramirez with 82. Mike Napoli has only swung at 66 pitches, but missed on 23 of them. Pablo has also chased 46 pitches by far the most on the team. 3. Xander Bogaerts and Mookie Betts lead the team with hits in seven games. Napoli leads the team scoring in eight of the 10 games, including at least one run in each of his last seven games. 4. Justin Masterson is 2-for-3 at the plate while Allen Craig is 1-for-12. 5. 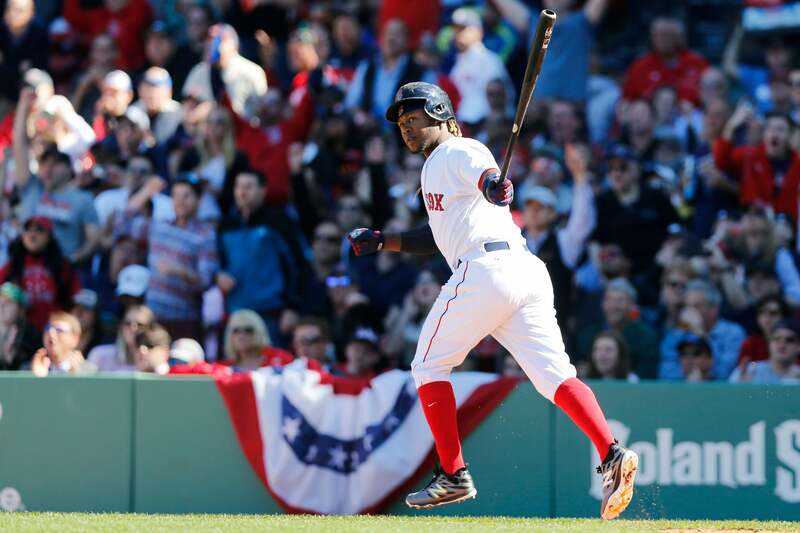 Ryan Hanigan‘s homer last night makes him the only who has hit just one homer: Hanley Ramirez has four, Dustin Pedroia has three, David Ortiz and Mookie Betts have two each. 6. Red Sox batters leading off an inning are hitting .134, the worst in baseball. 7. Pablo Sandoval is third in the AL in batting against righties with a .480 BA. He has 13 PA against lefties without a hit. 8. The Red Sox world champs of 1912 started off 7-3, just like the 2015 squad. 9. The Rays have worked 75 full counts, the most in baseball, but Boston is next with 66. The Rays have drawn 31 walks, the Sox 19. 10. Batters are 1-for-26 against Craig Breslow so far. 11. The Red Sox, Tigers and Cubs are the only other teams in the majors without consecutive losses in 2015. 12. Xander Bogaerts has already reached three times on errors. 13. Here’s why you love Brock Holt: he’s twice been on first when a double has been hit and twice he’s scored. 14. Mike Napoli has been up 10 times in double play situations and hasn’t hit into a twin killing yet. 15. MLB qualified batters average putting a ball in play on 27.89% of first pitches, Hanley Ramirez is the only Sox over that number at 40.0%. Shane Victorino has only swung at 3.3% of first pitches. 16. After 3-0 counts, the Sox are hitting .100, but after 0-2 counts they are hitting .220. 17. So far when the Sox are in the lead from the 2nd inning on, they are undefeated. 18. Of their 59 runs, 13 have come in the 3rd inning and eight have scored in the 2nd inning, but only three in the 1st inning. 19. Yankees pitchers have allowed 98 hits in 98 innings; Sox pitchers have allowed 80 hits in 98 innings. 20. David Ortiz has whiffed 10 times this season, nine times swinging and missing and five were against fastballs.